I recently found eight frames of capped brood in a 2-deep hive. A beautiful pattern of capped brood in the middle of every frame surrounded by a yellow ring of dandelion pollen and nectar. I immediately removed extra honey from the sides, slid the frames over and opened up space in the middle of the brood nest and inserted a blank frame (no foundation, nothing) and a frame of drawn comb. The drawn comb gives the queen room to lay and the blank frame gives the bees something to work on other than swarm preparations. I also happened to have a medium honey super full of drawn comb that I put on top, so when those eight frames of new bees start crowding the hive in June, the rest of the bees will have somewhere to go and something to do. If I was feeding my bees while all this was going on, it would be swarm city in my beeyard. I used to think feeding the bees and building up their numbers was essential to maintaining a healthy colony in a place like Newfoundland, but that’s not necessarily the case. A colony doesn’t have to be busting at the seams with bees to be healthy. A moderately sized colony might not produce as much honey for humans as a larger colony, but as long as it’s large enough to fight off predators and has enough honey for itself going into winter, then in my book it’s doing fine. I’d rather have healthy bees and a little less honey than out of control colonies. A postscript about that blank frame. Drone comb between the brood boxes is disgusting. The queen usually fills the space between the boxes with drone comb because she has nowhere else to lay. 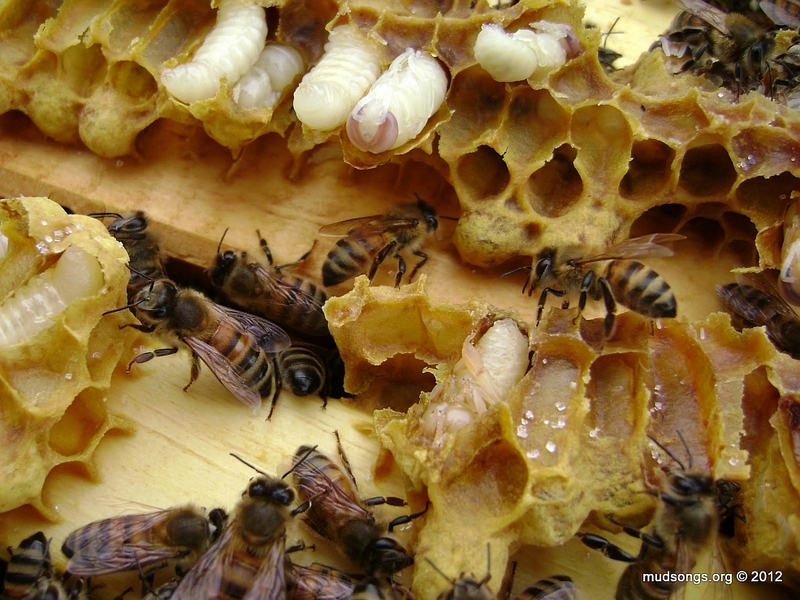 In a standard Langstroth hive with foundation, all the foundation usually has worker-sized cells imprinted on it, so the bees tend to build worker brood comb on it, not drone comb. That’s why the queen has nowhere else to lay and fills the space between the boxes with drone comb — drone comb that is a big ugly mess to clean up in the spring. And that’s why I insert at least one blank frame into the brood nest of every colony. Given the choice to build comb however they like it, if they’re short on drones (and they usually are in a Langstroth hive full of plastic foundation), the bees will fill the blank frame with drone comb instead of gunking up the space between the brood boxes with it. Again, I don’t know how right I am about any of this. Due to geographical isolation, I rarely meet with more experienced beekeepers who can tell me otherwise. But I think most of what I’ve said isn’t too far off. And I’m always open to suggestions. JUNE 05, 2016: I wrote a post about inserting a blank frame: A Blank Frame in The Brood Nest = Less Messy Drone Comb. This entry was posted in Brood Frames, Drawn Comb, Drone Brood, Drones, Feeding, Honey Frames, Inspections, Maple Trees, Month of May, Swarm Prevention, Urban Beekeeping, Year 2015, Year 2016 and tagged Practical Tips, Video. Bookmark the permalink.